It found that support for Muslim and Roma immigrants is lower than the average for 10 other EU countries. 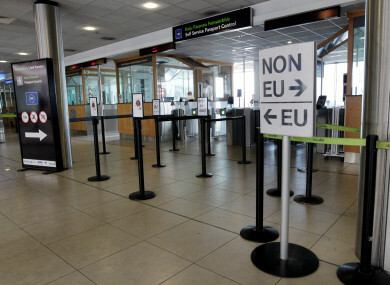 ATTITUDES TO IMMIGRATION in Ireland became more negative during the recession, and are now worse than the western Europe average, a report from the Economic and Social Research Institute (ESRI) has found. The new study has found that the attitudes of Irish-born people to immigrants and immigration vary significantly over time, depending on the ethnicity of the migrants, the education and financial security of the respondent, and the level of individual contact people have with different ethnicities. The data shows that support for Muslim and Roma immigrants is lower in Ireland than the average for 10 other western European countries surveyed. It revealed that 58% of those surveyed showed support for immigrants of the same ethnic group as the majority population in Ireland, in contrast with 41% support for Muslim and 25% support for Roma migrants. The study – Attitudes to Diversity in Ireland – draws on a survey of attitudes from the European Social Survey collected since 2002. It found that the positive perception of immigrants’ contribution to the economy increased between 2002 and 2006, before decreasing in 2008 with the onset of the recession. The most negative attitudes towards migration were registered in 2010, with attitudes becoming more positive as the economic outlook improved. It also established that frequent contact with people of different races and ethnic groups is directly associated with more positive attitudes if the contact is positive. Around one in four Irish-born people have contact with someone from another race or ethnicity every day, with 58% reporting contact at least weekly. There was no statistically significant difference between the attitudes of people of different ages or between rural and urban areas in levels of support for immigration. Finally, it found that just under half of adults born in Ireland believe some cultures to be superior to others while 45% believe some races are born harder working than others. The ESRI said that both figures are somewhat above the European average measured in 10 other EU states. “To support an integrated society, it is important for us to know how people in Ireland feel about changes in the population, and to understand the kind of social, economic and cultural factors which influence attitudes to diversity,” Emily Logan, chief commissioner of the Irish Human Rights and Equality Commission said. “This report offers an understanding of the prevailing attitudes to diversity and how those attitudes are formed and will help the Commission in its mission to build a fair and inclusive society that protects and promotes human rights and equality,” she said. Email “Irish attitudes to immigration worse than European average, ESRI finds”. Feedback on “Irish attitudes to immigration worse than European average, ESRI finds”.